Showing 6 articles from April 5, 2014. The Willapa Harbor Ministerial Association is sponsoring Wednesday night soup suppers and services during the church season of Lent, the time of preparation for Easter. Who’s Minding the Store at Pacific County Public Works? I have owned and operated Hawk’s Superior Rock, Inc. for 27 years. I employ four full-time and four part-time employees. I started having problems with Pacific County Department of Public Works when Esco Bell and Don Larson were director and supervisor. These problems still continue today. 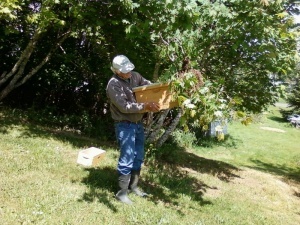 Taking care of Beesiness Photo by Gail Freidlander Paul Young is shown capturing a swarm in Riverview last summer. Rockett qualifies for "Court of the Table"
Outstanding client service, ethics and professionalism have elevated Robert Rockett Jr.